The legislature’s Appropriations Committee voted Monday to approve the bill that would enable the Mashantucket Pequot and Mohegan tribes to develop a commercial casino in East Windsor. Senate Bill 957 passed 33-13. Six members of the 52-member committee were absent. An alternative measure that’s also being considered, House Bill 7319, would establish a competitive-bidding process among operators interested in developing a third Connecticut casino. It would require the passage of further legislation before a commercial casino could be opened in the state. The tribes, respective owners of Foxwoods Resort Casino and Mohegan Sun, are pursuing a third casino as a hedge against the anticipated impact of MGM Springfield, a $950 million resort casino being built in Massachusetts. Connecticut stands to lose thousands of jobs and millions of dollars in revenue if it fails to defend its turf, the tribes maintain. Before the vote on the bill, several proposed amendments were defeated. The amendments sought to require a referendum in East Windsor, to set amounts of payments to towns surrounding the proposed casino and a provision that would have provided the state’s off-track betting system with a share of the casino’s revenues. Osten was joined by other members of the southeastern Connecticut delegation in supporting the Senate bill, including Sens. Paul Formica, R-East Lyme, also Senate co-chairman of the committee; and Heather Somers, R-Groton, as well as Reps. Mike France, R-Ledyard; Kathleen McCarty, R-Waterford; and Kevin Ryan, D-Montville. Rep. Chris Soto, D-New London, recused himself from voting, citing an unspecified conflict. “Another week, another milestone passed,” said Kevin Brown, the Mohegan tribal chairman. “We thank the committee for its work and look forward to a continued discussion with our partners in government,” Rodney Butler, the Mashantucket chairman, said. Members of the two tribes descended on the Capitol last week to lobby for passage of Senate Bill 957. 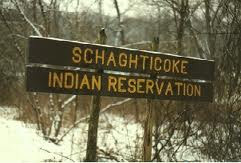 This week, members of another Connecticut tribe, the Schaghticoke Tribal Nation, will travel to Hartford to deliver an altogether different message. Unlike the Mashantuckets and the Mohegans, the Schaghticokes have not been recognized by the federal government, status that would enable them to pursue a federally regulated tribal casino on their reservation in Kent. Instead, the Schaghticokes are now focused on pursuing a commercial casino on nontribal land. “Studies clearly show southwestern Connecticut has five times the value for gaming development that East Windsor does,” Velky said. “This means thousands of good jobs can be created, the state will have access to the New York market we simply do not have in north central Connecticut, and Schaghticoke Tribal Nation will have a pathway to compete along with everyone else. “Our tribe stands ready, willing and able to compete for the right to offer commercial casino gaming in southwestern Connecticut — all we need is an open process and a pathway to compete, which this bill (7319) gives us,” he said. House Speaker Joe Aresimowicz, D-Berlin, said last week the third-casino debate could be dealt with as part of the state’s budget process. Osten, who has said she’s confident the Senate will pass Senate Bill 957, said she prefers the matter be decided by a bipartisan vote on a standalone bill.